This study is the first attempt to apply the SVH in the marine environment using hyperspectral imagery recorded by Compact Airborne Spectrographic Imager (CASI). How to map biodiversity at high spatial resolutions across large areas? This study was developed in the context of the HISPARES project. The aim of the project was to combine knowledge of high spatial resolution remote sensing, marine benthic biology/ecology, GIS (Geographic Information System) and spatial modeling into a map-based tool that allows making spatial planning decisions in shallow coastal water areas, based on scientifically sound data. Biodiversity is important in maintaining ecosystem viability, and the availability of adequate biodiversity data is a prerequisite for the sustainable management of natural resources. As such, there is a clear need to map biodiversity at high spatial resolutions across large areas. Airborne and spaceborne optical remote sensing is a potential tool to provide such biodiversity data. The spectral variation hypothesis (SVH) predicts a positive correlation between spectral variability (SV) of a remotely sensed image and biodiversity. The SVH has only been tested on a few terrestrial plant communities. This study is the first attempt to apply the SVH in the marine environment using hyperspectral imagery recorded by Compact Airborne Spectrographic Imager (CASI). The study was conducted in coastal waters surrounding Saaremaa Island, in the eastern Baltic Sea (figure below). The area is characterized by complex topography with numerous islands, islets, bays, and peninsulas. Sampling was conducted in September 2010. A total of 207 sampling stations were visited (figure below). At each station the seabed was sampled by deploying a remote underwater video device from an anchored boat. All recorded videos were subsequently analysed by estimating the coverage of benthic macrophyte and invertebrate species. In addition to the video recordings, biomass samples were collected from 37 sampling stations. The sampling stations for biomass samples were located to maximize the coverage of different habitats. The samples were stored deep frozen until analysis. Abundances and biomasses of all invertebrate taxa and biomasses of plant species were quantified. Abundances and biomasses were calculated per square meter. Airborne imagery was collected using hyperspectral imager CASI. Univariate regression was used to identify the correlation between CASI bands, CASI bands and principal components, spectral variability (SV) at different spatial scales, SV and biological variables. 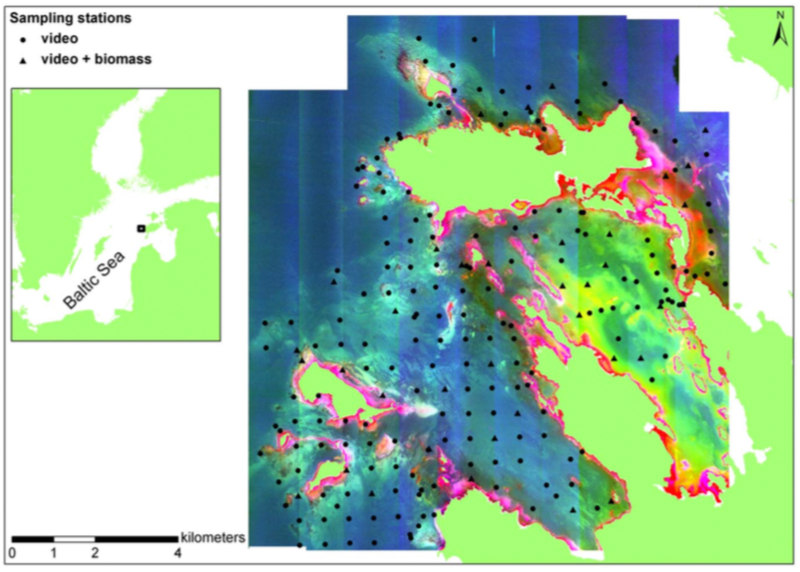 Generalized linear models (GLM) were used to analyse the relationships between several environmental predictor variables and benthic biodiversity variables. Models included depth, seabed slope, proportion of soft sediment, distance to land, distance to 10 m isobath, wave exposure, and SV as environmental predictor variables. All coverage-based diversity measures of benthic macrophytes and invertebrates showed low but statistically significant positive correlations with SV whereas the relationship between biomass-based diversity measures and SV were weak or lacking. The observed relationships did not vary with spatial scale. SV had the highest independent effect among predictor variables in the statistical models of coverage-derived total benthic species richness and Shannon index. Thus, the relevance of SVH in marine benthic habitats was proved and this forms a prerequisite for the future use of SV in benthic biodiversity assessments. The potential of SV in biodiversity assessments was further justified by the results of statistical models showing that SV often had the highest independent explanatory power amongst environmental variables to predict benthic biodiversity. This study also highlights the importance of biological sampling at multiple spatial scales in future studies in order to clarify scale-dependent relationships between SV and benthic diversity. This study was funded by the Central Baltic Interreg IVa Programme HISPARES. The study was additionally supported by Institutional research funding IUT02-20 of the Estonian Research Council and by the Estonian Science Foundation. The study has been partly supported by the project ‘‘The status of marine biodiversity and its potential futures in the Estonian coastal sea’’ of Environmental protection and technology programme of European Regional Fund.